Digital Studio is a flatplanning and digital magazine publishing software created for publishers to streamline the production process. 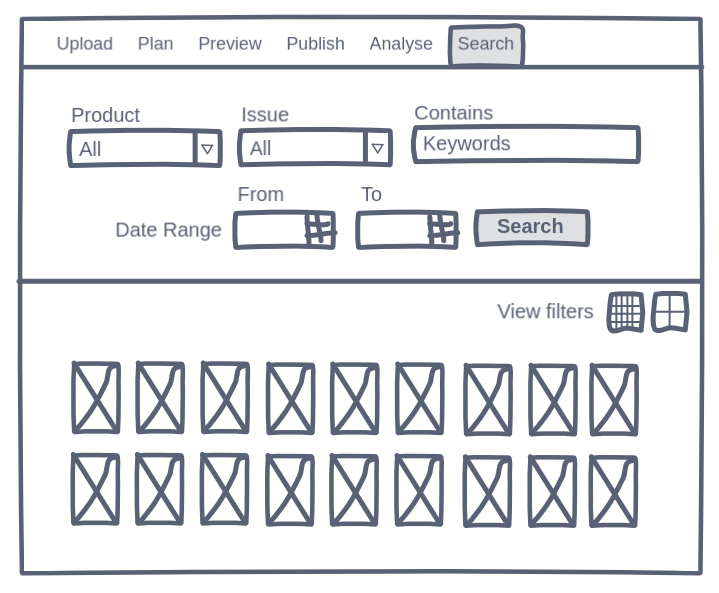 The flatplan is a page plan of a publication that shows how the articles and adverts are laid out. Flatplan is very important in magazine production and it should be used daily for a reference of finished layouts, layouts that need to be done, materials that arrived, ads and so on. The digital magazines are digital replica of print magazines. For years, publishers using printed copies of flatplan which is usually 50-250+ pages depends on the magazine size. As you can see, flatplan changes almost daily since some stories can be made longer or shorter if some ads drop out or new ads come in. Each time such a change occurs new flatplan is printed out and distributed to all the departments. This whole manual process and the communication between different departments about changes in the flatplan lead to many mistakes in production. I was responsible for I was responsible for conducting user research, creating task flows, running usability tests, sketching, and developing low fidelity mockups, high fidelity mockups. 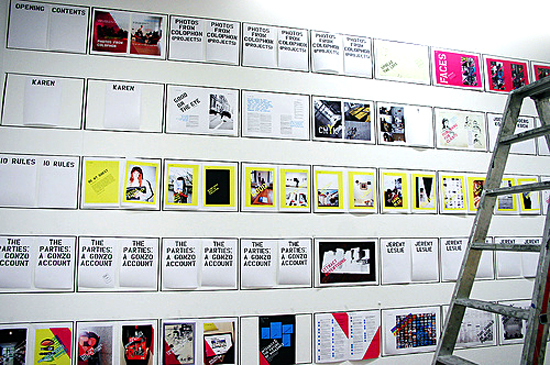 Magazine pages arranged on the wall (flatplan). ©Colophon. Replacing paper flatplans by digital flatplans which simplifies the communication between all the departments in the production process. Any changes in the digital flatplan will be seen by all the departments instantly. In addition to the above, Digital Studio also allows publishers to import the actual magazine pages (art) and convert them into digital magazines. With Digital Studio, we addressed most of the key issues in the prepress workflow process. We streamlined all the communication between different department such as production, sales, photography, and graphics. Being in the same domain for over 50 years we (the company) knew all the pain points of the entire manual prepress process. This helped us to define the problem statement clearly without spending a lot of time on market research. Without any second thought, we set our primary goal as to build something we want to use and simplify our own workflow first. The process started with speaking to people in different departments involved in the prepress process. We drew the entire manual workflow on charts, took note of all the pain points in the current process, and asked about their wishes. We also discussed the new solution that we are planning to build to solve these issues. Interestingly, some of the key features of our current application had come out of their minds. The points we noted in the above process (user research) helped us to convey the goal to all the stakeholders. 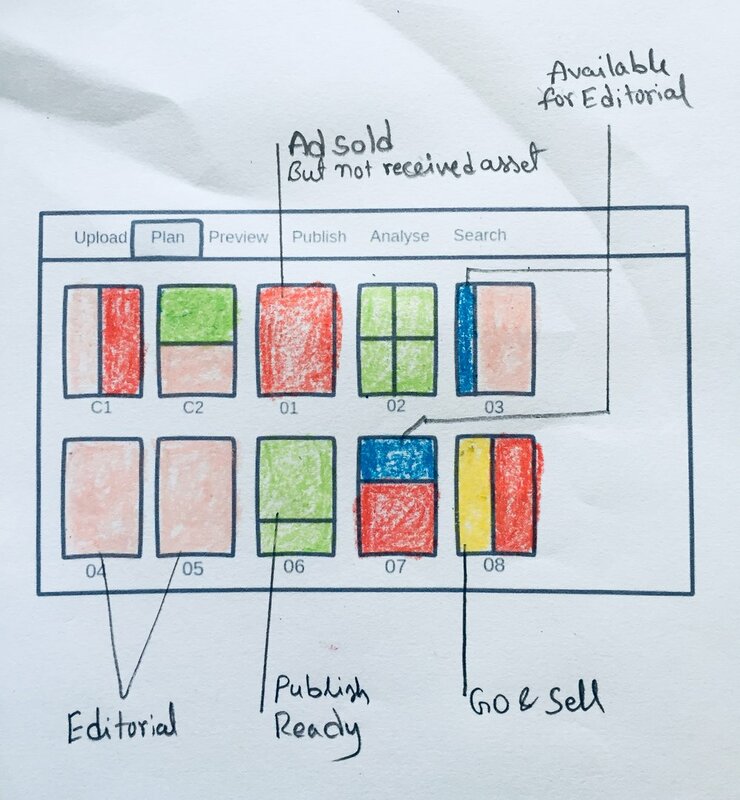 After many whiteboard drawings, paper sketches and hours of go-to meetings, we finally agreed on a design which simplifies the entire process in a single window. In the prepress process, sharing assets between different departments such as graphics, client and sales reps was a problem in that manual process. All the departments were using FTP accounts to upload their files whenever they make some changes. They send emails to notify about these changes. 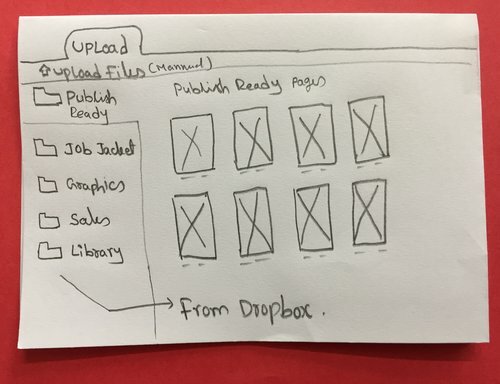 We solved this problem by integrating Dropbox with Digital Studio. Dropbox features made file sharing easy. Converting paper flatplans to digital format eventually solved most of the problems in the prepress workflow. There is no need for reprinting the flatplan each time there is a change in the plan. There is no need of distributing the physical copies of flatplan to each department. The stakeholders involved in the process can work from anywhere and see the changes others making. We used colors to differentiate the content types such as editorial pages and adverts. Each stage of the process such as copy received, awaiting copy, awaiting graphics, page completed, page signed-off etc., can be marked in different colors for a convenient visual aid and helps keep track of the evolving flatplan process. As I mentioned at the beginning of the case study, publishers can also use Digital Studio to publish the digital magazines along with the print edition. So the preview mode helps to view the magazine how it actually looks once published. In the Publish tab, with just one click, the magazine will be published to magazine central apps (newsstands kind of) available on Google play store, AppStore, and to the desktop newsstand. Analyze is one of the key features of the application. We track all the page views, user events such as external hyperlink linked, video's played, the number of time each ad is viewed on digital editions. This information helps sales reps to sell more. In the backend, we are using Google Analytics to track all these metrics using custom variables. While uploading the assets to the application, we recommend users to tag or add some information to each image/page/asset to make them searchable. So they can find these assets using the search feature whenever they want. All the usability tests conducted within our own labs (where the actual work happens every day) and we're continuing this whenever something new is released. We're also taking constant feedback from our 3000+ clients and working on further enhancements.